and I am sure I have overlooked at least one or two others. Why is I3C important? Research has identified several possible ways that I3C or its metabolites work in our body to prevent or interrupt the cancer process, such as converting estrogen to a less cancer-promoting form, killing cancer cells directly, or preventing damage to DNA through its anti-oxidant activity, as just a few of possible beneficial results of eating these vegetables. One recent research study showed that I3C inhibited the growth of the T-cell lymphoma cells in mice who were fed isolated I3C, leading these researchers to believe that this molecule could be developed into a chemotherapeutic agent in the future. My advice? I will likely come to sound like a broken record as you read future posts on this blog, but DON'T WAIT for that to happen - start incorporating all of these health-promoting vegetables into your diet on a daily basis (i.e., the inspiration behind the concept of 365 days of kale, or an equivalent vegetable!). There is more than I3C in these vegetables, and the health benefits from consuming these vegetables may very well come from and only be optimized by the intake of the whole foods (not isolated compounds like a dietary supplement or a drug) with the subsequent synergistic actions of all of these molecules in our body. I'll comment on all of these nutrients and molecules in future posts (along with more recipes for all the vegetables listed above), but if you can't wait, here are two great sources that give an overview of the benefits of eating cruciferous vegetables for you to read now. This is my first visit to your blog. I enjoyed meeting you in Chicago at FNCE. I've found more motivation to feed my family vegetables from this list! 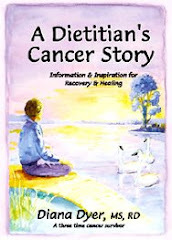 Thanks for your insight into feeding our bodies to prevent cancer. I love your passion for vegetables. You've inspired me to explore more ways of eating kale and other unfamiliar produce! I especially like learning why our bodies need these foods so much. I just loved meeting you too at FNCE last year! I'm looking forward to seeing you again next year. AND I just love your blog http://frommykitchentable.wordpress.com/. I found I could not stop reading it this morning! I wish you were my next door neighbor. Check it out everyone. You've inspired me to start a new category of "favorites" - RD blogs I love. Kim - thanks for the feedback AND for picking up some rutabagas for us. My husband will be SO happy. He has developed a recipe for glazed rutabagas that he wants to make again (and again and again) - yes it was that good! Diana, any idea how the concentration correlates with dark green-ness? Is cabbage just as good or is it the darker the better? Kale on Pizza? "Yes, we can!"